I suppose you've already guessed I've been sick. That dreaded flu from the news. I'm much much better but will be taking it easy for a few more days. Tell me what's new and all that. I should be on the come back trail soon! 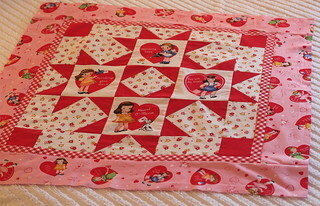 In the meantime, have you seen the finished 2012 Auriful Block of the Month Quilt? Check it out here. Good morning everybody? 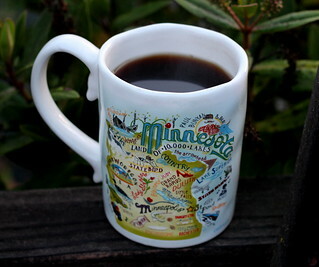 I'm greeting the day with coffee and some internetting and then hopping on the freeway to meet Holly. Can't wait! I have a million ideas floating around and the attention span of a 5 year old, so yesterday in between all the other stuff I had going on, I managed to start a little project. Clearly I didn't get too far, maybe later today. Sometimes you get an idea and you want to act on it. This year I am hoping to be better at completion. We'll see. I don't want to jump into anything! Good morning! It's been ages, right? I can't believe it. We left Friday the 11th and drove to Anaheim for the CHA Winter Show. 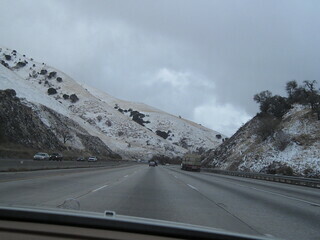 The pass between the San Joaquin Valley and Southern California had been closed the night before, but by Friday afternoon the snow looked pretty much gone. I was expecting something closer to when Elizabeth and I drove through snow, but this seemed pretty tame. Still pretty chilly though. Roseann invited Frankie and I to attend the show with her. It's a great opportunity for me to see what's new in other areas of the craft industry, not to mention just plain old fun! Here's Roseann and Frankie working on a Make and Take at Lawn Fawn. Roseann is such an inspiration to me, and of course many others. 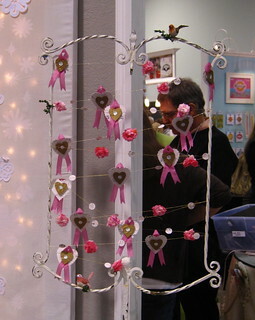 One of my favorite things at CHA was Brenda Walton's area at the Sizzix booth. I have been a long time admirer of Brenda's and it was nice to get a chance to meet her in real life. I just want to make darling little things like this. I can't help it. CHA was filled with amazing dies everywhere. You just want to get a die cutter and go to town. Walking about I saw Brigitte's bag and I thought it was so cute. Finally I stopped her and asked if I could take a photo, I just thought it was so darling. My picture doesn't do it justice. Brigitte has a website, not in English, and it's fantastic. Go there now! You won't regret it. I love the displays, so much inspiration. Here's one in the Pebble's booth. Cute.. loved it all. Sometimes seeing new things helps you feel excited about making again. 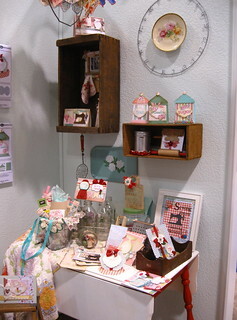 Back at the Sizzix booth, I feel in love with this little vignette. I believe this is part of the Antique Fair group, but I can't find a link on the website. This would be perfect in fabric as well don't you think? 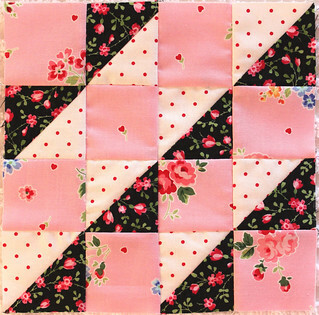 A cute quilt block? 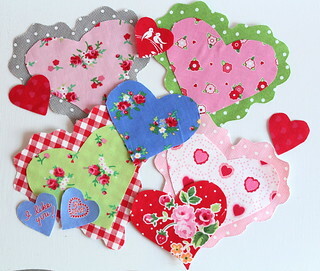 Some of the dies that are mainly for paper will also cut fabric. I could totally see some of these elements in a block of the month, can't you? I love all the retro styles that I saw, and how colors seem brighter and cheerier this year. 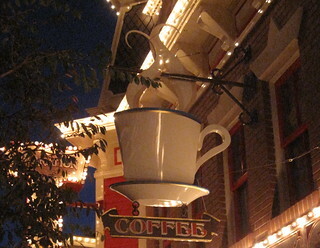 Monday we headed into California Adventure. Lots of new things there to see, including the new Car's Land. Totally adorable retro area. It was packed. It was very cold and windy on Monday morning. 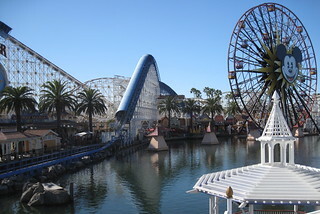 The California Screaming ride was stopped, and if you zoom in you can see that the cars are stopped middle of the ride and the people had to WALK OFF. TERRIFYING to me, since I'm afraid of heights. They sat there stopped for probably 15 minutes or so, with Disney people talking to them, then off they all walked. I was totally traumatized watching from afar! But inspite of the cold it was a wonderful day, just look at that blue sky! Tame rides are more my thing. 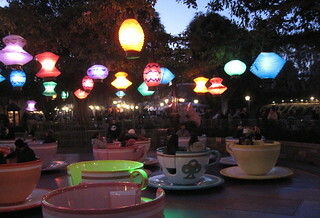 Nothing is prettier than the tea cups of Disneyland. I would love the cheery look in my backyard year round. Inspite of the cold, it was a great day. Unfortunately some where between Monday evening and Tuesday morning I was struck with a bit of the flu! WHAT THE HECK? So Tuesday Bret and Frankie ventured back into the park without me, making trips back and forth to the hotel to check on me. I was disappointed for sure. Wednesday we drove home and I plopped in my chair for the rest of the week. Crazy. I'm just thankful I wasn't horribly sick, considering all the flu that's out there now. But I'm back at it! Tell me all about what you've been up to! I'm so out of the loop! For more about CHA check out Suzy's blog. For more reviews of the show and picture of booths and projects Google CHA Winter Show Review and you'll find a wealth of info! Edited to add: Roseann's review of CHA here. Good morning! I'm here bright and early and I have my homework ready to turn in ... what about you? 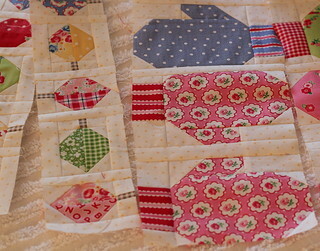 We're on our second month working on blocks from Civil War Sampler. Are you stitching along with us? This month my five block are the next five in the book. You can see last month's blocks here. 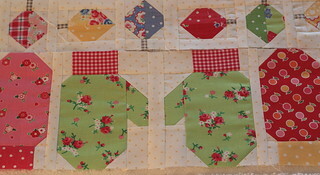 Check out Debbie's and Kimberly's block from last month here. 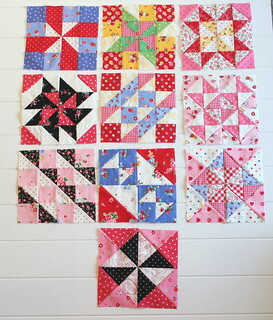 I really like how they're turning out, and I think it's going to be a very cheerful and fun quilt! I laid them out all together for a peek. Have you checked out the flickr goup? 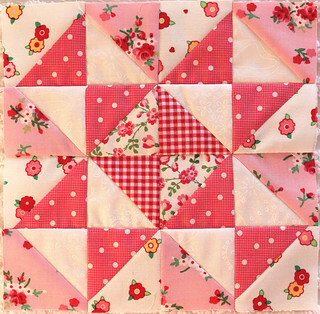 We also have a board on Pinterest where you can see all our blocks. Now it's time to head over to the Jolly Jabber to check on Kimberly and Debbie's homework! See you back here on the 15th of next month with more homework! Hi there everybody! 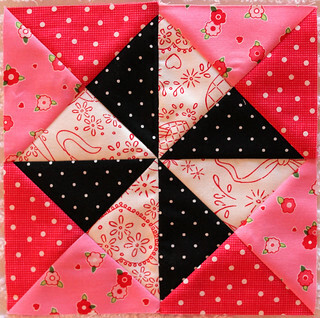 This morning while I'm away, I have the pdf for the Oh My Stars quilt ready for you. You can click here to download the pdf. Be patient, it make take a while to download. When I am back, I'll put a link on the side bar to follow. 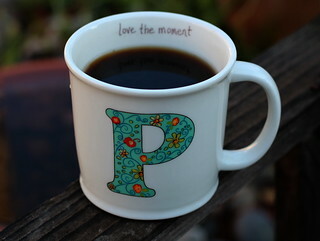 Just taking a few minutes for the last few swigs of coffee before hitting the road! I'm off to Anaheim for the CHA Winter Conference. I'm so excited to be meeting up with Roseann again for the show. It's a great opportunity for me, and I'm lucky to have a great friend like Roseann to bring me along! So it's Thursday! I know it will shock you, but I finished my bag. Of course it was after dark and getting a photo around what I used to think was my cheerful house is a challenge I'm not quite able to to meet. Ignore all but the bag. Here's another attempt. I call it the mugshot. Apparently white bead board under florescent lighting isn't very nice either. My photoshop skills are pretty non-existent for actual photos so you're forced to just deal with these. I'm so excited to have actually completed it I wanted the photos so I could empty my old purse into it. And seriously, the photos don't do those Inazuma polka dot handles justice. Emma, from Emma Creations sent them to me and I've been hanging on to them till Pam Kitty Love arrived. I love these handles. 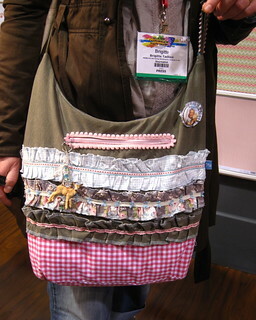 Lots of quilt shops now carry them, and I think they really make a bag special. Hop over to look at all the wonderful possibilities there... so many fabulous purse handles! Ok, that's it for today! Hope your week is coming along nicely! I'm up early. Is it time for our next installment of the row-along? I can't wait to work on that. It's always so exciting to see what's next. 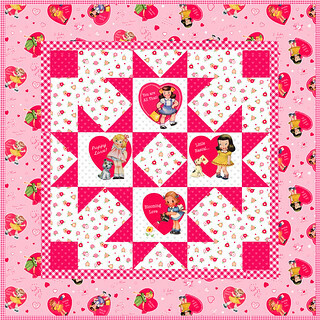 While we wait, check out Nanette's darling Valentine's Table Runner in Pam Kitty Love! So super cute and there's a tutorial for it! Even better. Hi there everybody! 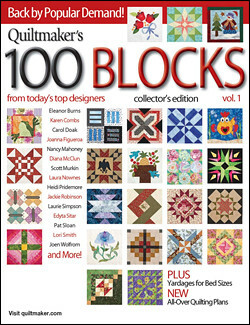 I heard some exciting news, Quiltmaker's 100 Block first issue has been reprinted! If your collection is missing Volume 1 now is the chance to pick one up! 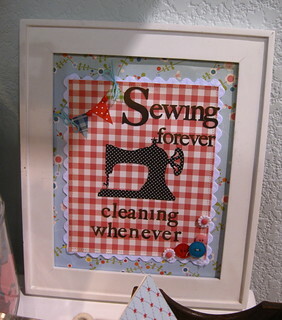 You can read all about it over at Quilty Pleasures and enter to win a copy by leaving a comment! 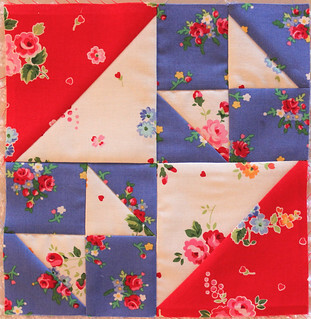 One of the fun things about this issue was my block was right next to Monica's, and they were both made from the same fabric and were perfect companion blocks. 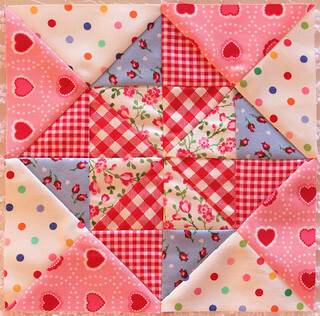 You can check out her blog post here and see what a cute quilt she made using the two blocks together. More Monica Genius at work. 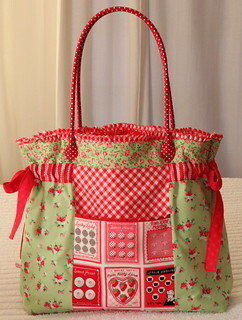 And now, as proof of sewing, here's the front of the bag. That pocket is huge and will hold a lot of stuff. Now I just need to get fusing and then I can sew it all together. Ok everybody, I'm back to work. Have fun! So are things back to normal now? I didn't realize that school wasn't in session till this morning. Nothing gets back to normal for anyone till everyone resumes their schedule, right? I'm out of the kid loop. We used to love the holidays but we always did much better on our regular routine. This week is a busy one, lots of errands and things to do. But I'm making time to whip up a new bag for myself. 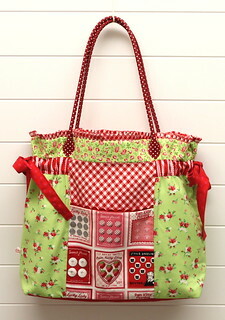 I've wanted a new Farmer's Market Bag but I haven't been able to decide which fabrics to use until now. 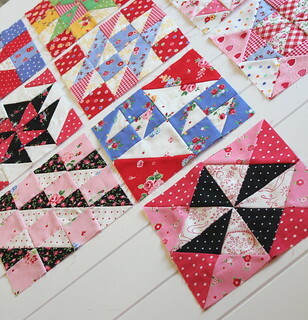 I think these will make some fine pockets, now I just need to decide which rick rack and get busy cutting the rest. What's on your agenda? So how did your week go? I've been stitching away on a little Valentine's project. 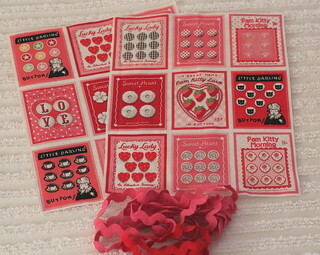 I really love Valentine's Day, perfect colors.. PINK AND RED!!! After Christmas, who can resist seeing something new out in the stores.. not me! I'll tell you, making anything bigger than a loaf of bread makes me wish for some more square footage around here. No place to back up and get a good photo. But you get the idea. This little project will soon be a pdf you can download. I just need to sit a spell and write the instructions. 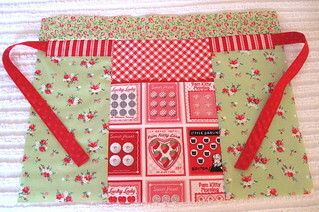 This little project is quick to stitch up, there's just not much too it. 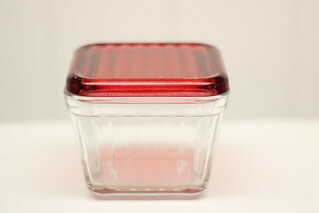 In the mean time feast your eyes on this..
isn't this the most perfect little food storage dish? Target is trying to win my affection with these. It might be working. I show here today some really lame photos of my latest two row along rows. I just can't get good photos, although to be honest, I only tried half-heartedly yesterday. I think I waited to long, the light wasn't as good as it is earlier in the day. Originally I wasn't a huge fan of the leaves, but after seeing them made up, I really like them, a lot. Turns out I'm also a fan of that gray gingham. It made the perfect stems. What I also love is using Pam Kitty Love in those mittens. I had originally thought I'd keep it all PKM but I just couldn't help using that green, and then resistance was futile. I can't wait till next week to work on the next row. Maybe Lori will post it early? A girl can dream. Ok, that's all for show and tell today. What are you working on? 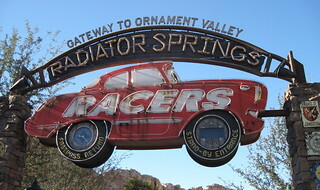 Are you working on that scrappy-trip-along? OMG the pictures are killing me. Check them out here. Hi there! Yup, I'm back here with coffee at our usual spot. It's 2013 and I can hardly believe it! How did the first day work out for you? I'm going to need you to catch me up on everything! 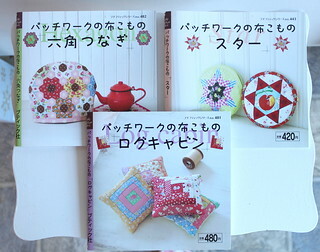 In the meantime, you might remember these cute Boutique Patchwork books if you've been meeting me here for a while. I wrote about them here, here and here, and even Monica mentions the little Square Patchwork one here. They are the cutest little Japanese books, and I bought them at Kinokuniya back in 2007. 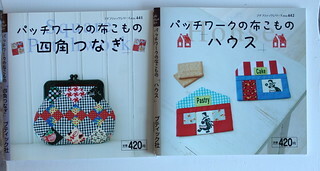 It was at the beginning of my obsession with Japanese craft books. The little projects are darling. But let's get to the point. I'm not trying to traumatize you with things you might not be able to find! I was browsing through Amazon and saw the cover of this book. Those projects look pretty familiar, and low and behold, it's a compilation of the 5 craft books! IN ENGLISH! 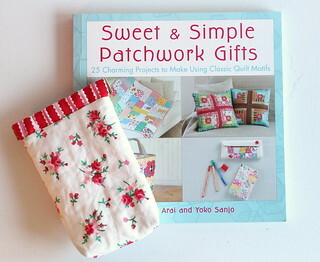 I ordered it right off and have to say, it has most of the really cute projects I loved. The instructions probably aren't the greatest, but at least I can read it! It's enough of the projects that make it a worth while purchase for me. Space is at a premium around here, so I need to pace myself with acquisitions. I did make this cute little spring frame purse which I think came out cute. I've been working on some other things, I'll get my camera out to show you proof of that tomorrow! Have a great day super peeps! Happy New Year!